In a year when it seemed like everyone decided to just live their best lives through becoming their best selves, the Sports Nutrition industry broke all of its own rules to meet that demand. At Muscle Foods USA, we enjoy a bird’s eye view of the entire Sports Nutrition industry, lending us the ability to inform our customers on current and coming trends in order to keep your store shelves as profitable as possible. 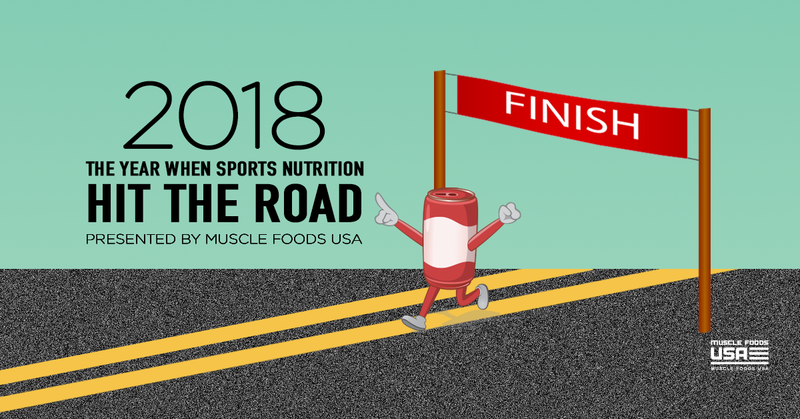 Here are MFUSA’s top three sports nutrition trends of 2018, along with some predictions for the year ahead! The Sports Nutrition industry swung hard in 2018, keenly capitalizing on the wave of renewed interest in the Health & Wellness category. Previously regarded as a niche market, Health & Wellness is now typically referred to as a “lifestyle” category, meaning that more and more people have chosen to adopt nutrition as a way of life, not just as a hobby. It’s no surprise, then, that 2018 was, without a doubt, the year of on-the-go nutrition. This sector of the market has gotten so big, we now publish two additional catalogs a year just for On-the-Go items! Honestly, the streets of Times Square had barely been swept before Quest Nutrition announced the arrival of new Quest Cookies at the beginning of the year. Now, you can find muscle-building, belly-filling protein in some of your guiltiest pleasures, like almonds, chips, cheese puffs, and popcorn! 2019 Prediction: During the 2018 Olympia, we got a glimpse at some of the awesome new protein treats our vendors have in the works. Let’s just say that 2019 is going to be one sweet year! Next year, we expect to see less new protein bars, if any at all, and more new protein snacks in ways you’ve never seen before. You might, at most, see some new flavors of well-known bars hitting the shelves, but #TeamMFUSA doesn’t really foresee any new traditional protein bars hitting the market next year. Any new releases might receive less-than-stellar fanfare as more exciting innovations crowd the calendar. Gone are the days when individuals get three flavors of protein powder to choose from and not much else. Along with the rise of functional snacks came the revival of functional sports beverages. Most of the focus in this particular space, however, rested on fizzy drinks in particular. Now, Sports Nutrition companies are producing new carbonated pre-workout, protein, and recovery drinks at a record pace. 2019 Prediction: In the field of performance beverages, 2018 was a year of incomparable innovation and excitement. We expect the release of new energy RTD’s to slow next year, as vendors focus more on pushing their flagship drinks. Sure, you will see new flavors, and we will certainly see more innovation, just not at the breakneck speed we’ve grown accustomed to in 2018. We also predict more vendors will pull away from releasing new energy drinks and possibly shift to releasing more of their core powdered products, such as MRP powders and BCAA powders, in pre-mixed can or bottle form. While last decade brought us a whole flock of low-carb diets, from Atkin’s to South Beach, this year saw the rebirth of the Keto diet. Though many athletes have known about and followed ketogenic diets for ages, newer scientific studies from the past year have boosted the keto diet’s many potential benefits aside from weight loss (possible cancer-fighting and neurological benefits, for example), once again bolstering the diet’s popularity. Individuals following an extremely low-carb diet, such as keto, can now find boatloads of products tailor-made to suit this diet’s potential hurdles (mainly stemming from convincing the body to switch over from burning stored glycogen from consumed carbohydrates to burning stored fat as an energy source). Setbacks to the keto diet, such as sluggishness or “wasting” muscles for energy, may be avoided with proper supplementation. This has paved the way for an era of keto-specific performance, lifestyle and recovery products, brimming with keto energy sources like MCT Oil or BHB Salts. Even candy can be keto-friendly now! 2019 Prediction: If 2018 was the year of losing your gut, 2019 will be the year of keeping it happy. Gut health has become a recurrent theme in our vendor meetings lately, with some brands already distributing gut-friendly products through us, such as collagen peptides or apple cider vinegar pills. Left and right, people are discussing dietary fiber as if it was the ‘90s again. Science has also trended toward studying the effects of macronutrient-specific diets[1,2,3] on body composition, and how a healthier gastrointestinal system helps athletes maintain their hard-earned composition. Now that folks are counting carbs over calories, they have become aware of the world of diets like “IIFYM (If It Fits Your Macros)”, whereby macronutrient content in food takes precedence over the total energy (calories) that food contains. Bonus Prediction: Sports Nutrition is now more popular than ever. Scroll through your Instagram feed if you don’t believe us and count the number of posts you see regarding someone’s health, nutrition, or fitness quirks. Regular Joes can now make a quick buck slinging supps on their personal pages, and brand ambassadors, if not bodybuilders, typically are just like you and me: regular people looking to get by. However, in 2018, ProSupps introduced DJ Khaled as the new brand ambassador for the Hyde Power Potion RTD line. This high profile partnership even led to a new flavor collaboration between the two. We expect to see more high-profile partnerships like this in 2019, with Sports Nutrition companies making bigger marketing buys on television ads and experiential marketing stunts. Have some trends or predictions of your own you’d like to sound off on? We’d love to hear them! Head over to our Facebook page and let us know what you think 2018 brought, and what you feel 2019 has yet to bring. Need to place an order? Sign in here! Not a customer yet? Call us for more details!